We chose North Shore Shark Adventures, located on Oahu’s North Shore. We arranged pickup from a hotel in Waikiki, and were driven up to the quaint Haleiwa Harbor. After a short safety and information briefing, we loaded into our boat and began our journey out into the ocean. We were provided with backgrounds on the types of animals we would possibly encounter, including Galapagos, Sandbar, Hammerhead, and Grey Reef sharks. The ride to the dive spot was serene, traversing a nautical route devoid of other tourists. About two miles out, we reached the spot where a second staff boat was anchored and preparing for the tour. They showed us where the cage had already been dropped into the water and was awaiting us. They explained that the sharks were likely already there, as they had gotten used to the designated drop site and waited for the anticipated commotion. 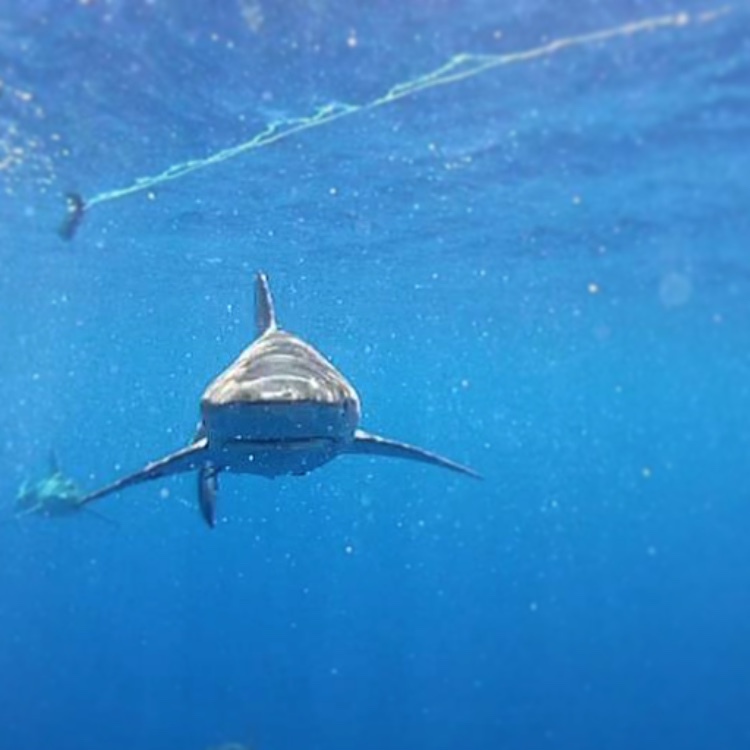 Although no bait was used during our time below the surface, there was some bait dropped in the water prior to our arrival, just to ensure that sharks would be enticed. We donned our scuba gear and inched towards the edge of the boat, peering out into the murky depths below. The surface was deceptively calm, and we had no way of knowing the flurry of activity that was awaiting us! 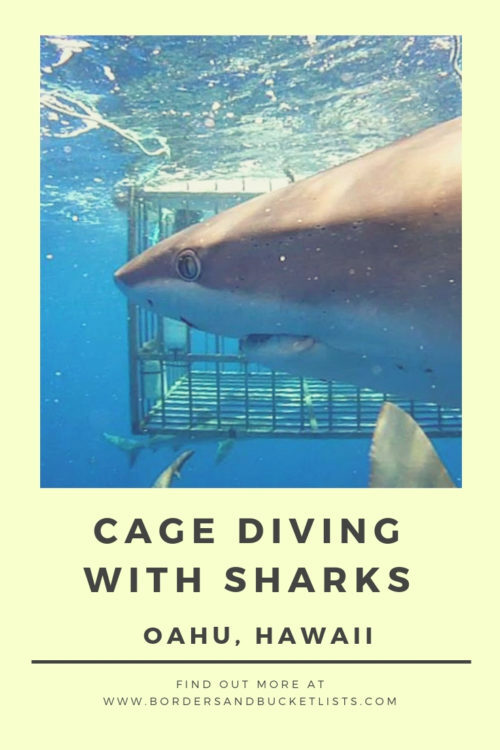 As soon as we dropped down into the cage, we were immediately face to face with a half dozen sharks, swarming and veering sporadically around us. Each shark had its own apparent method for investigating our presence. Some lurked in the shadows inconspicuously, and then charged towards the cage without warning. Others drifted silently past, checking us out in their peripheral vision. Others floated motionlessly in place, inches from the cage, peering at us with metallic yellow eyes. A few seemed unconcerned, and simply pestered each other. In an almost endearing way, we got to see each of these animal’s personalities emerge during our time underwater. You might think that coming face to face with these creatures would cause most people to freeze in their steps, but we did not have that luxury. For us, our time below the surface was almost as frenzied as the sharks themselves. 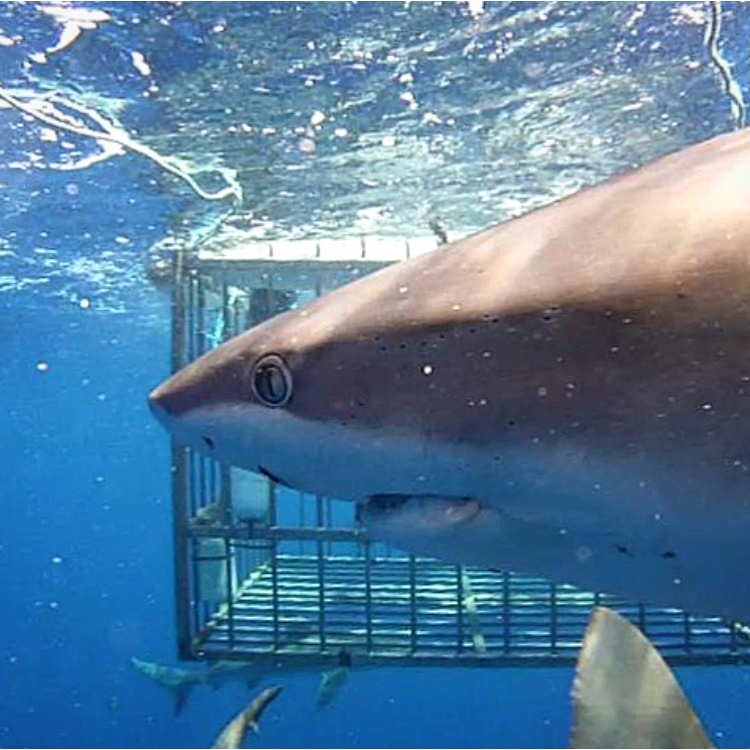 Though none of the sharks ever attempted to bite at the cage or engage in any actions that caused me to fear for the structural integrity of the vessel, I still preferred to float towards the center of the cage. Psychologically, though I knew I was safe, I could not bring myself to get that close to the thin barrier that separated me from these marine predators. Without being able to hold onto the bars directly to support and steady myself, I had to “dog-paddle” continuously to maintain my upright floating position. By the end of our thirty minutes, my arms and legs were exhausted! On the way back to shore, we reviewed with our tour guides the events we had just witnessed. They told us that most of the sharks that day were Galapagos sharks, a very common tropical water inhabitant. Though this species can grow to a maximum length near twelve feet, the ones we witnessed that day were all under ten feet. Unfortunately, we did not witness any of the rarer shark species, such as Hammerheads, or any of the other marine life present in the area, such as dolphins or turtles. I cannot say that this trip cured me of my fears completely, but it put a new perspective on them! I was able to see past the primal reactions that many of us have towards these creatures, and view them as unique components of their underwater world. This experience added to my inventory of active travel opportunities, and learned a little more about my own strengths! 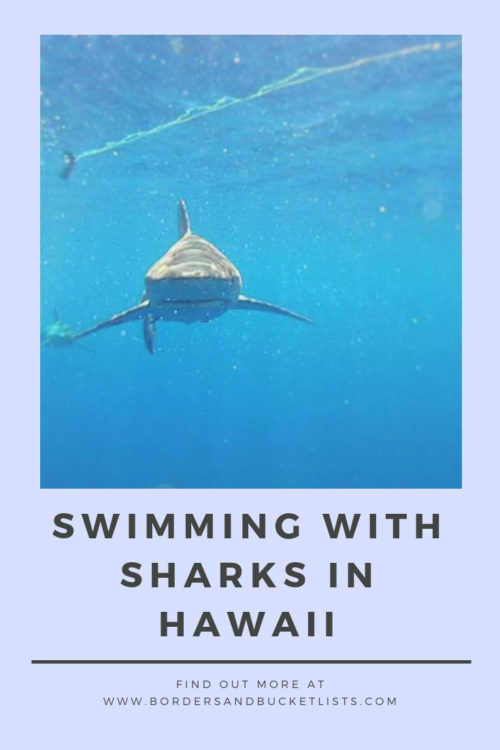 Meet the Author of “Swimming with Sharks On Oahu”! Kristen here, from Yonderlust Ramblings! 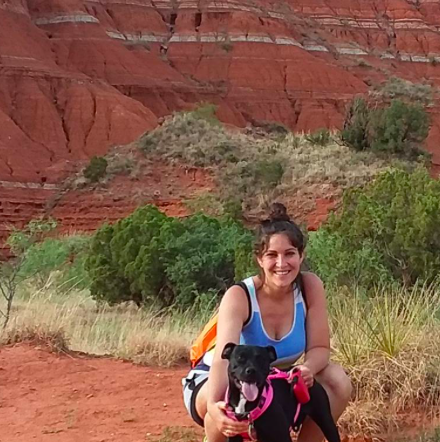 I’m an experience-seeker, adventure lover, road-tripper, “run-cationer”, hiker, backpacker, “high-pointer”, and goal-setter, and I love passing on my passion for exploring the world, and hopefully inspiring others as well! I believe travel is possible for anyone with any resources, and I am a teacher so I intend to put my money where my mouth is! Travel is not a magical place or something that requires you to board a plane or spend thousands of dollars. It can be as easy as taking another route home from work! Check out all the parks in your city, your state, or in the U.S.! What I can promise is that you WILL grow from each experience, no matter how lofty or local they are! My mother always told me that travel is the best education, and learning should be a lifelong challenge and pursuit! I believe that the best form of travel is the natural kind, where you let your own two feet do the work! I am a big proponent of “runcations,” “hike-cations,” “cycle-cations,” or any kind of goal-inspired active travel! There is no feeling quite like crossing that marathon finish line, summiting that peak, or hiking that trail! 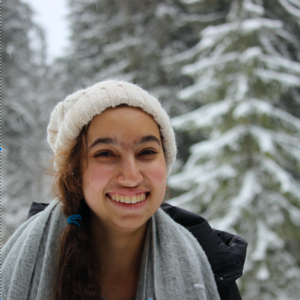 The possibilities for this kind of travel are endless, and I hope to share some of my experiences with you! Follow them on Facebook, Twitter, and Pinterest! Looking for other fun sea creatures to see on Oahu? What about some sea turtles? Did you enjoy this read? If you did, you should pin it for later! I have always wanted to swim with sharks! It’s been on my bucket list for as long as I remember. It looks like you had an incredible experience! Thankyou for sharing. Ooh looks like you have a sense of adventure!! This is such a great write up. We went to Hawaii on honeymoon and enjoyed many hours in the water. We even went snorkelling from a boat off Kuaui – we didnt see any sharks but thats a good thing seeing as we weren’t in a cage. This looks like such a wonderful encounter though. I love Kristen’s writing style too! I think it was perfect for telling this story :).